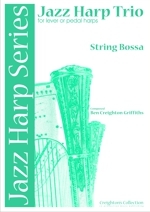 String Bossa is a piece for three or four harps. 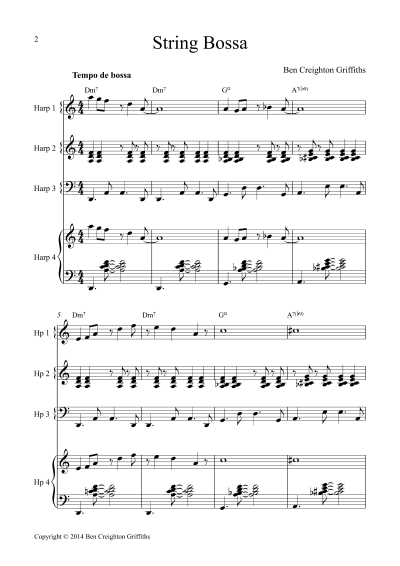 Parts one, two, and three can be played on Lever Harp and cover the melody, chords, and bassline of the piece. Part four (pedal harp) is to enable teachers to accompany their student groups. There are three written improvisations – one for each part. These can be played as written or altered at the players discretion. Alternatively the chord changes are provided above the music so that performers can improvise over their respective section. String Bossa is a Bossa Nova and so players should try to emulate a traditional Latin style throughout.